6878: Radio Pirate Music ? (or Playback ?) [difficult to copy ID] @ 1729. SINPO 32233 (some teletype interference). 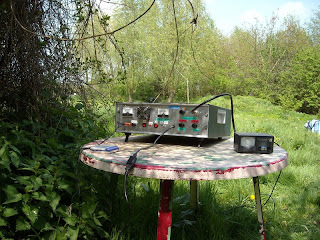 6220: Mystery Radio @ 1655. SINPO 44333. 6882: Radio Playback @ 22.02. SINPO 34333. Playing some blues and jazz. I will post a recording later. 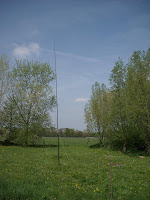 3905: Radio Borderhunter @ 2208. SINPO 44343. Later I will post a recording. 6882: Radio Playback @ 20.11. SINPO 34233. I will post a recording later. 3907: Radio Bluestar @ 20.04. Playing Metallica "Nothing else matters". SINPO 32232. I will post a recording later. 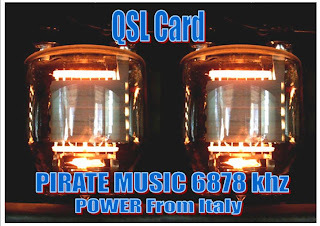 QSL card for my Pirate Music Radio reception report of 29 April 2008; frequency: 6878 kHz time: 18.34 - 21.49 UTC; SINPO: 33233.